Onboard the Gravytrain: Fire at the office! Around 11:30 this morning, our office manager came back to the studio part of our office because she thought she smelled something burning. The rest of us just thought it was the heat kicking on because the radiators generally emit lots of funny smells when they get hot. A few minutes later, our building super comes over the loudspeaker and says "Do not use the elevators. There is smoke in the elevator shaft. I repeat: do not use the elevators." But that was ALL he said. In life threatening situations, I would appreciate a little bit more guidance from those in charge. Does smoke equal fire?! Should we evacuate using the stairs instead?! My coworker Karen and I didn't waste time waiting for answers, bundled up, and headed for the nearest fire stairs. People seemed surprised we were leaving. There is smoke in the hallway! Yes, I am leaving. We made it down all 11 flights to the street where several fire trucks had parked themselves in front of the building. Eventually, all the tenants trickled out of the building, but there was no sense of urgency to anything. I guess there were no explosions or fire blazing out of the windows, but you could see some smoke billowing out of an open window of the elevator shaft. Maybe nothing phases New Yorkers. 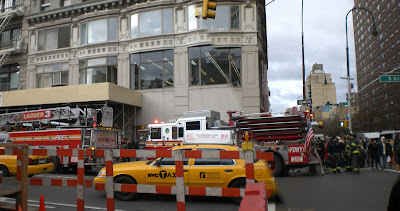 It was obvious that the building was not going to burn down but looked like it could take the NYFD a little while to do their business. It was cold so Karen and I ran around the corner for lunch and hot chocolate until it was safe to return. When we got back, everything seemed cleared up but they weren't running the normal elevators (for obvious reasons). Karen and I weren't quite psyched about climbing back up to the 11th floor, so we took a ride on the freight elevator. The office smelled like smoke for the rest of the day, but 2 of the 3 normal elevators were operating by the end of the day. #3 must have been the culprit. I'll have to get the scoop from my favorite doorman tomorrow. Let's hope 80 Fifth Ave stays safe from now on! Update: Turns out there was welding going on in the elevator shaft and sparks caught something. It's a building wide joke that our mildly incompetent building supers (the one's who can't make a proper fire announcement) were doing the welding themselves, hence the mishap. We had a fire-drill the following morning that people were reluctant to participate in. It was great when I got to tell them about your story!